(Newser) – It's been a relatively crazy day at Amsterdam's Schiphol airport, which has had to deal with a bomb threat—straight out of World War II—and a hijacking ... that apparently never happened. 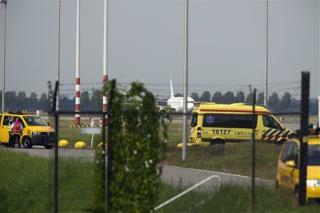 Meanwhile, reports that a plane was hijacked en route from Malaga in Spain to Schiphol today ended up being false. Dutch media initially reported that the plane was escorted to the airport by two F16 fighter jets, but Spanish airline Vueling tweeted this explanation, per the AP: "Amsterdam's protocol for security was activated owing to a temporary loss of communication between the plane and air traffic control." One of the passengers on board reportedly added that all was calm and there was no hostage situation. Historical trivia that Nazi Germany occupied Holland????!!!!!! !